372 pages | 41 Color Illus. | 29 B/W Illus. 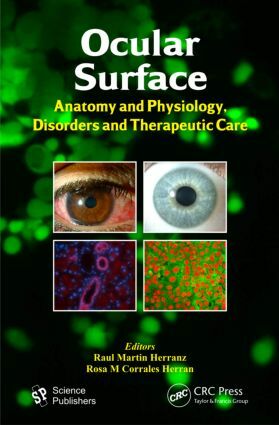 This book has been conceived to aid eye care practitioners such as ophthalmologists and optometrists as well as other eye care or research professionals such as biologists, biochemists and medical doctors interested in the Ocular Surface. This text is divided into four main sections. The first section is dedicated towards the anatomy and physiology of the ocular surface (defining ocular surface concept, tear film structure, corneal and conjunctival anatomy, etc.). The second section covers the most common ocular surface disorders (dry eye, anterior and posterior blepharitis, keratitis, ocular allergy, cicatricial conjunctivitis, and the ocular surface alterations related with Glaucoma treatment). The third section delineates the therapeutic care of these disorders, including topical, systemic and surgical treatment options and the fourth section addresses the relationship of the ocular surface and contact lenswear (describing the indications for contact lenses wear, their complications and managing the adverse effects related with contact lens-wear).